A 1918 draft list for Sandersville, Georgia. Approximately 24 million men registered for the draft in 1917 and 1918. Those who were drafted reported to their local draft boards and then traveled to camp to train. To keep track of draftees and whether they reported for duty, each local board created forms. Form 1029 PMGO included a draftee's name, serial number, classification, and other identifying information. On this form, Eddie Landrum (1899-1937) is listed with order number 2090, serial number 515, and Classification I, which meant he was immediately eligible for service. He, along with the rest on this list, reported to Camp Gordon for training. Elijah L. Landrum, who went by Eddie, was born on July 3, 1899 in Sandersville, Georgia, the son of a farmer and a farmer himself before the war. This occupation was common of African American men living in the rural South. Like many others, Landrum registered for the draft once the United States joined the war. However, as he was under the age of twenty-one, Landrum listed his birth year as 1895 to be eligible. On August 22, 1918, Landrum was drafted for service and sent to train at Camp Gordon, just northeast of Atlanta, Georgia. After, Landrum served as part of the 157th Depot Brigade, which remained in the United States to receive, train, and uniform new recruits who would then be sent to fight on the front lines in France. After the war ended, Landrum was discharged and returned to his work as a farmer. He married, and eventually settled in St. Augustine, Florida. On March 24, 1937, Eddie Landrum passed, and was buried in the St. Augustine National Cemetery in Section A Grave 208. 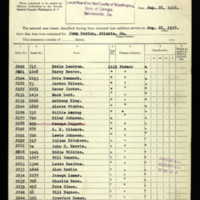 Digital reproduction of original typwritten draft list, August 22, 1918: Records of the Selective Service System (World War I), 1917-1939, Record Group 163, NAI Number 1159403. Originally created and published by the War Department, Office of Provost Marshal General, Selective Service System. Florida Department of Military Affairs. "Section A." St. Augustine National Cemetery Index and Biographical Guide. St. Augustine, FL: State Arsenal, St. Francis Barracks, n.d. http://ufdc.ufl.edu/UF00047708/00001/74x. Florida State Bureau of Health, Bureau of Vital Statistics. "Certificate of Death - Eddie Landrum." Florida Deaths, 1917-1939. Online database with images, FamilySearch. St. Augustine, St. Johns, Floirda. FHL micrfilm 2,135,947. Accessed August 10, 2018. https://www.familysearch.org/ark:/61903/1:1:FP7N-GBS. Litwack, Leon F. Trouble in Mind: Black Southerners in the Age of Jim Crow. New York: Alfred A. Knopf, 1998. "U.S., Lists of Men Ordered to Report to Local Board for Military Duty, 1917-1918." Online database with images, Ancestry.com. Accessed July 11, 2018. https://search.ancestry.com/search/db.aspx?dbid=4906. War Department, Office of Provost Marshal General, Selective Service System. 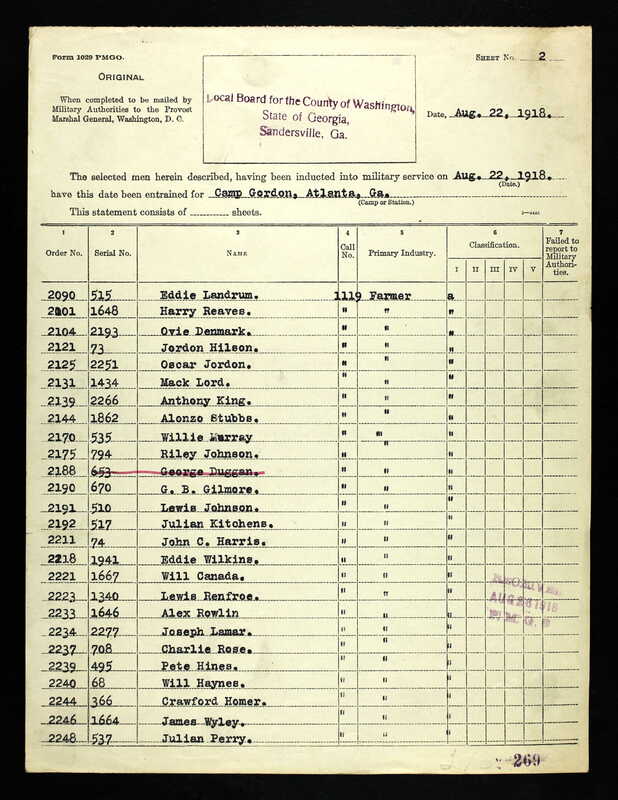 “Draft List, 1918.” RICHES of Central Florida accessed April 24, 2019, https://richesmi.cah.ucf.edu/omeka/items/show/10373.